March 14, 2003 the Corvette Olfert Fischer left his base harbor at the naval base in Korsør. His mission was to join the NATO standing forces in the Atlantic Ocean in its readiness against international terrorism. What was almost routine suddenly changed when the Parliament took its historic decision only seven days later. Denmark added the Corvette to take part in the Danish military contribution. - Now the Corvette and his crew were on their way to war. 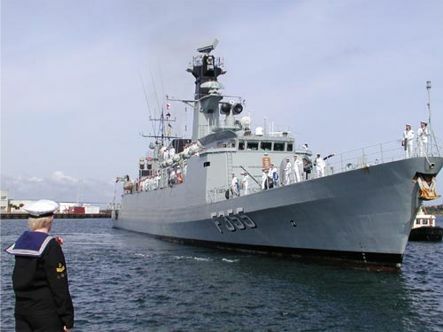 Friday, March 14, the Corvette Olfert Fischer sailed from naval base Korsør under the command of Commander s.g. Gustav Lang. 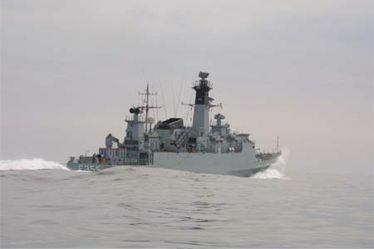 The Corvette was to take part in the NATO standing forces in the Atlantic Ocean, STANAVFORLANT. The participation of the Corvette was part of the routine and planned contribution of the Navy to maintain this standing force. For the past years STANAVFORLANT has operated as part of the international effort against terrorism, the so-called Operation ACTIVE ENDEAVOUR. The Corvettes NIELS JUEL and OLFERT FISCHER, as well as the submarine SÆLEN had taken part in similar operation in the Mediterranean in 2001. Current the OLFERT FISCHER was deployed in the Mediterranean from April until July 2002 and the submarine SÆLEN joined it in June 2002. The Corvette was expected to return to Korsør by the end of June 2003. The same day as OLFERT FISCHER left Korsør, SÆLEN arrived in Bahrain. Friday March 21, 2003 the Danish Parliament wrote history by passing the resolution nr. B 118, in which the Parliament gave its consent to provide Danish military forces for a multinational military effort in Iraq. For the first time since 1864 Denmark became a warring nation. OLFERT FISCHER, who was also participating in Operation FARAWAY in the Persian Gulf 1990-1991, was now for the second time in the Arabic Gulf, but this time with a completely different mandate. In cooperation with SÆLEN, who was already in the area, OLFERT FISCHER formed the Danish contribution to the US-directed multinational force in the war against Iraq. For the second time in nearly ten years the Corvette ones again set course against the Persian Gulf, but this time not as the Danish contribution to a FN embargo, but as an actual warring nation. Already March 18, the crew onboard the Corvette had been briefed considering the possible changes in the voyage. This resulted in the immediate preparing necessary on the ship. To a large part of the crew, this was not their first time in the Gulf. Many had taken part in the first mission in 1990-1991. Others had earlier experience with international operations, which made the change from crisis to warfare easy for the majority of the crew. Among other things, the participation of the Corvette in international operations since 1990 had caused the crew in general to find one self at a rather high level of education and experience. Sailing through the Mediterranean, the Suez Chanel, the Red Sea, the Bab El Mandeb lane, the Indian Ocean and further through the Hormuz lane, the crew was given the time necessary to train routines and procedures with particular reference to the task given in the northern part of the Arabic Gulf, also known as the Persian Gulf. After 20 days at sea, it was a happy, but rather tired Corvette-crew who arrived at the small island-state of Bahrain in the Persian Gulf. With only one single night alongside quay at Crete in a snowstorm, the 100 man crew was relieved to be on firm ground. Bahrain not only welcomed the vessel with 38 degrees in the shadow. It was also the harbor of the US 5th Fleet, by which the entrance and the harbor was considered a High Risk Area. When Manama, the capital of Bahrain, raised as a misty line in the horizon, OLFERT FISCHER was encountered by fast-moving heavy armed patrol boats with Stars and Stripes flying in the wind. No one on board the vessel could have had any doubt that the ship were near its destination. A giant Aircraft carrier, warships in all its aspects and submarines were dominating the harbor and the quay, while the Corvette was entering the harbor in close-combat procedure. A liaison officer from the submarine SÆLEN welcomed the Corvette to Bahrain. 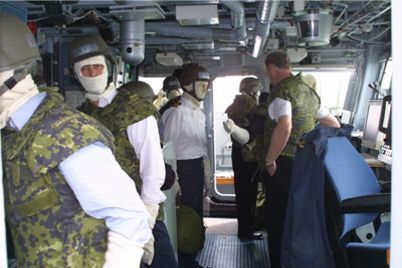 State of Alert procedure and busyness on the bridge was part of the warfare preparedness on board. The next couple of days were used on taking in supplies and spare parts; especially repairing and maintenance of machinery after almost 14,000 km continuously voyage from Korsør. The crew had to settle with visiting the American part of the harbor. Cause to high readiness of the area, they were not allowed to visit the capital. By sunset the harbor was sealed of. On board the Corvette the crew would watch the specially trained sea lions, which were taking care that no one would sneak up on the coalition ships under the shelter of night. Under one of the meetings with the US command centre, the CO of OLFERT FISCHER convinced the US Navy-management that the Corvette was capable of more than just flying the flag. After receiving his operational plans, the CO gathered the crew for a briefing on the foredeck. They were tolled to operate in the northern part of the Gulf. The ships primary objectives were to keep a watchful eye on the traffic and to protect ships and vessels that were carrying supplies and emergency aid for Iraq. Several members of the crew would had wished for an operational area a bit further from the hot spot of the war, but the confidence to the ship and his crew resulted in everybody feeling ready and well-prepared for the job on hand. On April 9, the 63rd year's anniversary of the German occupation of Denmark in 1940, OLFERT FISCHER left the harbor in Bahrain heading for his area of operation with the Danish naval flag flying from the quarterdeck. The Corvette was to take part in combined Danish-, US- UK- and Australian operation. Due to the disturbances in the area the Vessel had to keep up a very high level of readiness onboard, which could be hard in the long run. A Corvette is not equipped to stay at sea for several weeks and its crew is not large enough to keep up a constant military preparedness, for which reason it was necessary to change the organization onboard, to maintain manning the primary functions around the clock. The material and weapon systems onboard the Corvette fully lived up to its expectations. This, even through the comparatively extreme weather conditions with sandstorms, a very high level of salt in the water and air, the different water and air temperature etc. This system had an especially high cost of readiness in case of suddenly technical difficulties or mal-functions. 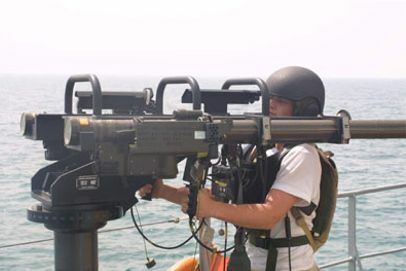 OLFERT FISCHER on patrol in the Persian Gulf 2003. From the beginning the OLFERT FISCHER had been pointed out to operate in the northern part of the Persian Gulf, in an area geographical placed between Iraq and Kuwait. The mission was to secure some of the oil terminals in the area. These terminals had previous been occupied by the US forces to make sure no unauthorized personnel were gained access. Especially because of the many fishing vessels, the local "dhow's", there was work to do for the Corvette and his crew. But it seemed the fishermen sailing in the area were only in good intentions. 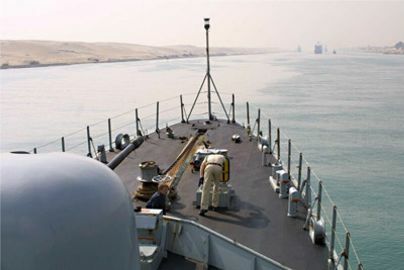 After several days guarding the northern area of the Gulf and the oil terminals, the Corvette was commanded up into the Khawr Abd Allah inlet, which separates Iraq from Kuwait. From here it should solve necessary protection assignments. The constant threat from the close lying mainland demanded a resuming state of alert on board, but the mission was solved without any troubles what so ever. Monday May 5, a church service took place on the quarterdeck of OLFERT FISCHER. The service not only marked the day of the Danish liberation in 1945, but it also marked the official ending of the military task force in Iraq some days before. Still assignments were plenty on board the Corvette and the slightest suspicions that an inbound ship did not have a clear conscience, resulted in continuing inspections. No act of terror against the coalition forces where to be accepted. On May 7, the Corvette was to carry out his last mission, escorting an US tugboat tugging a barge to the Iraqi port in the city of Umm Qasr. Even though the task forces had official ended, there was still a possibility to meet resistance from small isolated opponents. For that reason the dangerous navigation through the inlet of Khawr Abd Allah heading towards Umm Qasr was accomplish in the highest state of alert on board the OLFERT FISCHER. 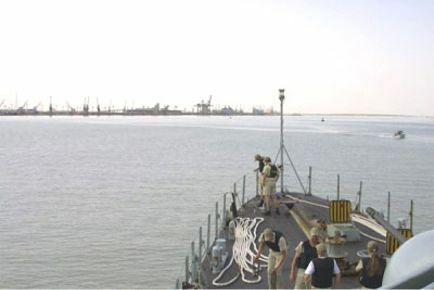 This assignment was carried out without any problems and OLFERT FISCHER was presumably the first Danish warship ever to call at an Iraqi port. Ready for a port of call in close-combat procedure. Officially the operations in the Arabic Gulf had ended May 9, 2003, when the Danish Parliament decided to call back both OLFERT FISCHER and the submarine SÆLEN. After a short visit in Iraq the Corvette returned to Bahrain the same day that the Danish Parliament passed the resolution to recall the Danish vessels. The crew immediately started taking in supplies and prepare the long sail towards domestic waters. Contemporary they shortly had the opportunity to visit the small island-state of Bahrain. As early as May 10, the Chief of Defence, General H. J. Helsø and the Admiral Danish Fleet, Rear-admiral K. B. Jensen arrived to express their satisfaction with the work of the OLFERT FISCHER and SÆLEN. Heading home the Corvette called port in Valletta at the island of Malta. Heading home was rather uneventful. 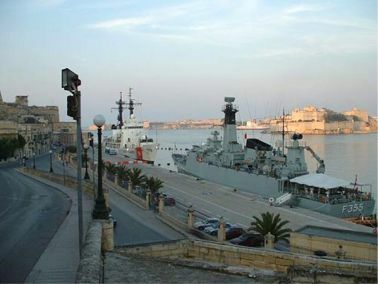 The Corvette visited among others Malta and Lisbon. Through the Straits of Gibraltar the ship was in increased defence preparedness. Having Europe on the starboard side and Africa on the port the Corvette meet with the Danish Missile-ship RAVNEN, which were patrolling the area. Of cause the two ships greeted one another on the correct maritime way in close encounter. The crew was clearly proud to have taken part in the complicated operations in an area which geographical placement, with the extreme weather-, wind-, sea-conditions, had been very challenging. Three month of uncertainty and worries, both at the crew and relatives, were released when OLFERT FISCHER again called at the port of naval base Korsør June 14, 2003.
after exactly 3 months of operations.